Predicted winner: Christopher Myers for Jabberwocky. Awesome illustrations! Hands down, the best I’ve seen this year. This guy gets better every year. My personal choice: Shane Evans for When Harry Met Sojourner. I know, silly of me to select a book solely on it’s cover (I haven’t seen the book in it’s entirety, yet). But I’d love to see this award given to someone other than a past winner. 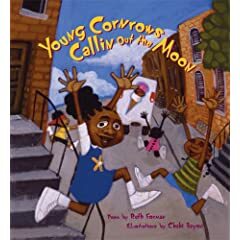 The community of African American children’s book illustrators is so small, it doesn’t seem right to give the award to the same people year after year. Also, I’m a huge fan of this talented artist. John Steptoe New Talent Award for illustration: Cbabi Bayoc for Young Cornrows Callin Out the Moon. Question of the day: Where are the African American female children’s book illustrators? And since I’m an illustrator, I pay close attention to the Caldecott awards too. My pick: Shelley Jackson for Chicken Chasing Queen of Lamar County. Such fun, crisp, refreshing illustrations. Or, maybe they’ll award the medal to Christpher Myers. Wouldn’t that be cool? 1. Cozbi Cabrera – she has 2 or 3 books. 4. Dinga McCannon (NY quilter and artist)… in the 1970s she wrote two books as well as illustrated. I think that’s true of illustrators and authors. I’d love to see the CSK committee spread their wings a little. And, wishful thinking, but I’d also like to see them broaden their criteria just a smidge. There are authors who are impacting the children’s lit community for other reasons beyond the historical content of their books. So much so, that I’m hoping it will cause a significant increase in the number of Af Am teens reading our books. And those who have played a part in that movement (Hi Dana Davidson, I’m looking at you) need to be acknowledged. Don, you and Paula’s blogs have been helpful for me in creating my own predictions for CSK. I admit in the past that I didn’t pay much attention to who won and I see a lot of the same people winning as you both alluded to in your entries this week. So for my predictions, I am purposely choosing people who have never won before. Narrows the selection pool down somewhat, but let’s celebrate some newbies too. I love your question, Don: Where are the African American female children’s book illustrators? Kadir Nelson is always a front runner. Henry’s Freedom Box was excellent. I was surprised that Christopher Myers didn’t win even an honor for Jabberwocky, the illustrations are really fresh and inventive.